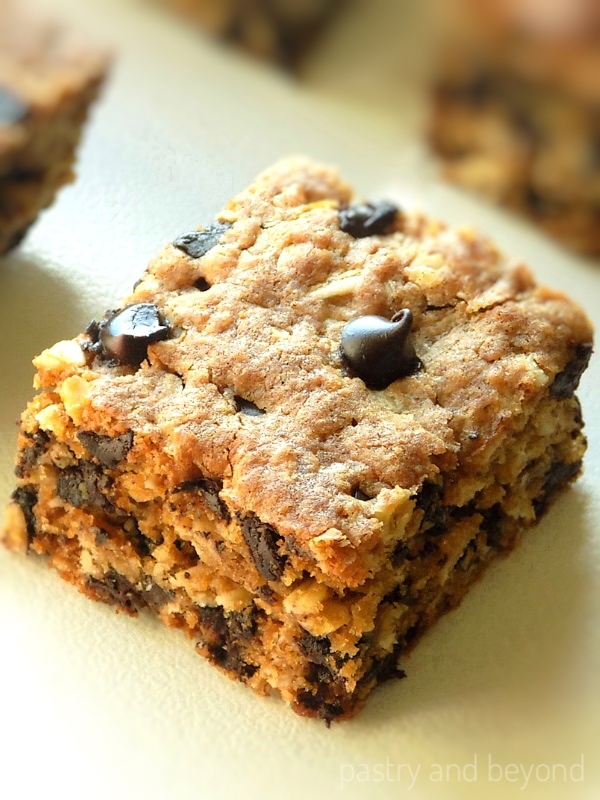 You’ll love these soft, thick and chewy oatmeal chocolate chips bars. They are delicious and so easy to make, no mixer needed! 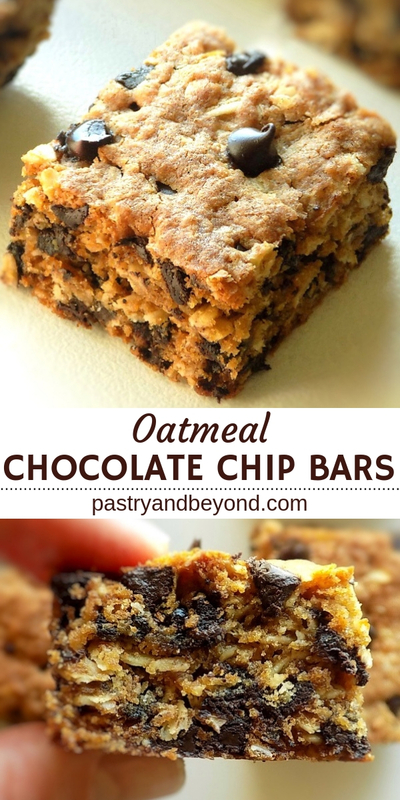 Today I am sharing my oatmeal chocolate chip bars. If you have made my apple crisp cookie cups, you know how delicious my cinnamon oatmeal cups are. They are soft and chewy. 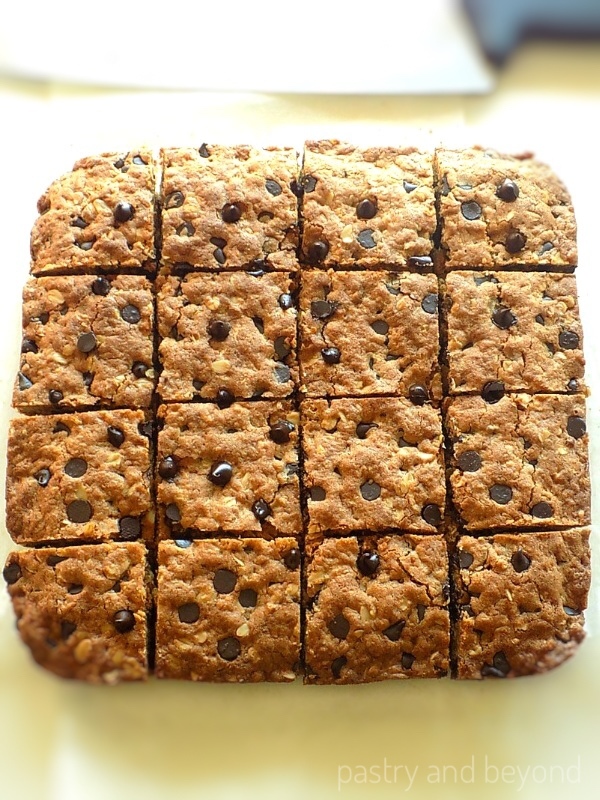 Now I am making chocolate chip oatmeal bar version but with a different method. In my cookie cups, I use the creaming method where I beat sugar and butter first and then add the other ingredients. However today in my chocolate cookies cups, I use melted butter so I don’t need a mixer. The result is again soft and chewy bars. 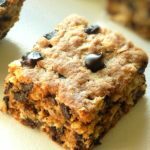 What Makes Oatmeal Bars Soft & Chewy? Cornstarch makes these oatmeal cookies soft and brown sugar makes them chewy due to molasses. 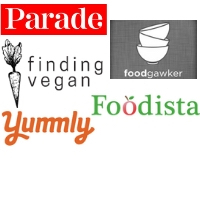 How Long Do Oatmeal Bars Last? You can keep in an airtight container at room temperature up to a week and in the freezer up to 3 months. If you like, you can keep well-wrapped cookie dough in the fridge up to 3-5 days and in the freezer up to 3 months. First combine flour, baking soda and cornstarch in a medium bowl. Set aside. Then melt the butter halfway, remove from the heat and stir so the butter cools fast. Next, place the sugar in a large bowl and add the melted butter and stir. Later add the egg and stir. Then mix in the vanilla. Add the flour mixture in 3 batches. You can use a spatula after the 2nd batch as it will be easier to mix. 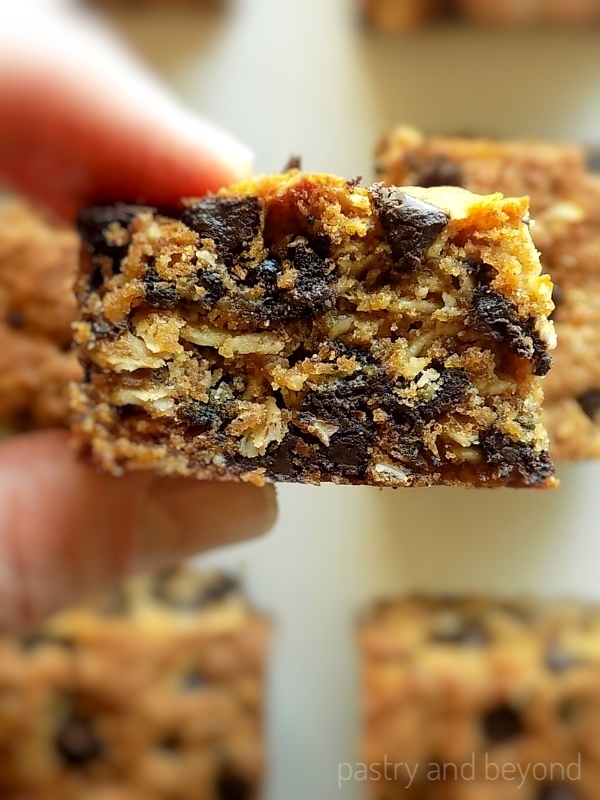 When combined well, add in the chocolate chips and stir with your spatula. Place the dough into a parchment paper lined 8*8 inch square tin. Bake for 25 minutes or until they are golden brown. If you like you can add extra chocolate chips while it is still hot. When it totally cools, cut into 16 pieces with a sharp knife. If you like chocolate chip desserts, you should also try my salted caramel filled Chocolate Chip Cookie Cups! 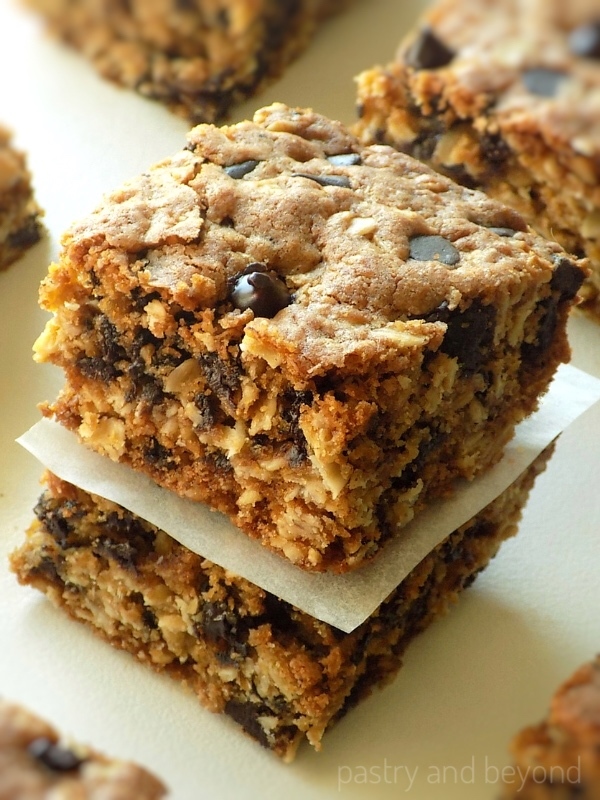 These oatmeal chocolate chips bars are soft and chewy. They are delicious and so easy to make, no mixer needed! 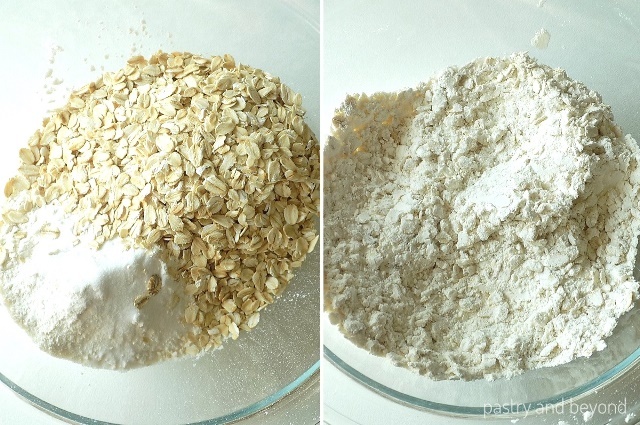 Mix flour, cornstarch, salt (if you are using) and baking soda in a medium bowl. Set aside. Melt the butter halfway in a small saucepan over medium heat. Remove from the heat and stir until it is all melted. 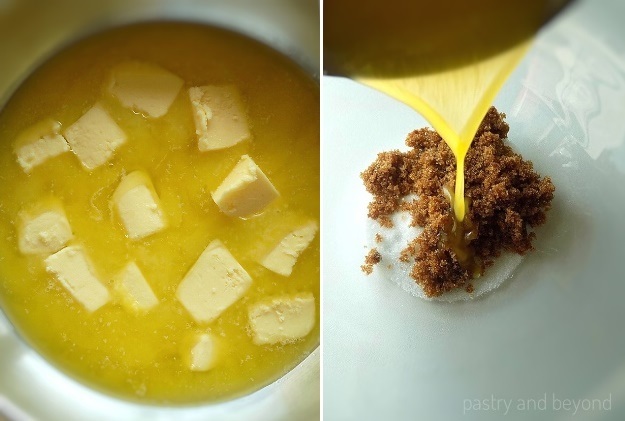 Place the sugar in a large bowl and add the melted butter, stir. 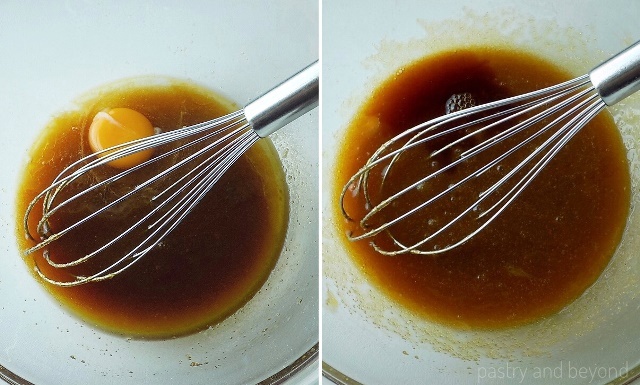 Then add the egg and stir, mix in the vanilla. Add the flour mixture in 3 batches. Use a spatula after the 2nd batch as it will be easier to mix. 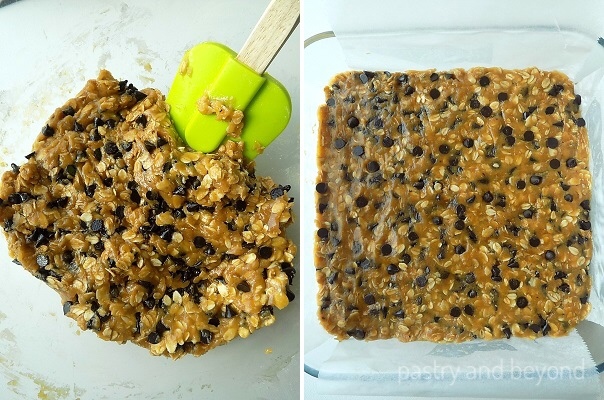 When combined well, add in the chocolate chips and stir with your spatula. Place the dough into the dish. Bake for 20 minutes or until the top sets. When you insert a toothpick in the middle, it should come out clean with little crumbs but it shouldn't be wet. Make sure not to overbake so the bars can stay soft and not dry. If you like, you can add extra chocolate chips while it is still hot. When it totally cools, cut into 16 pieces with a sharp knife.